You could be forgiven for thinking that previous experience would have taught if you’re excited about seeing a new film, the reality is often something of a let down. 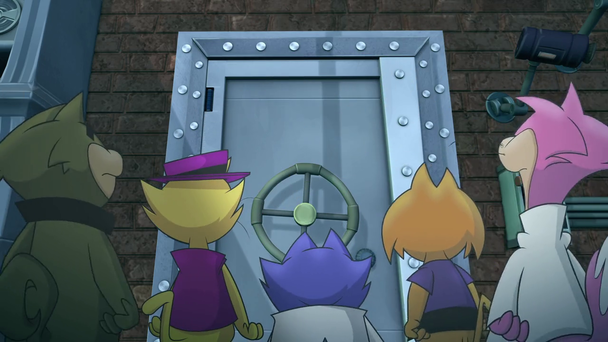 Take for instance Top Cat: The Movie (voiced by a band of unknown actors). Though this first big screen outing for the cult 60’s TV show may have all the elements you remember, from the recognisable theme tune to the voices of TC and the gang (which incidentally are bang on the same as the originals), the resulting animated escapade is unfortunately disappointing – TC may be the leader of his pack, but this film is certainly no ‘Top Dog’. TC and his pals – Benny the Ball, Fancy Fancy, Choo Choo, Spook and Brains – are in trouble. New York’s new head of police Chief Strickland is a nasty piece of work and has the boys, and their hapless nemesis Officer Dibble, in his sights. Determined to rid ‘his city’ of all nuisances, Strickland has TC thrown in jail on false charges and locks the others out of their alley. Will the cats be able to save TC and stop Strickland and his robots from turning New York into a police state? With Dibble on the case who can tell! The problem with Top Cat: The Movie is that it is clearly selling itself on nostalgia, which is dangerous when your primary audience of preadolescent children are unlikely to have ever heard of the feline capers of TC and his gang of disparate alley-cats. The trip down memory lane may be fun for those who remember the show first time round, but the unfortunate truth is that anyone who fondly views TC through rose tinted spectacles is likely to be less than impressed in what they see here – even with the aid of 3D glasses. Peppered though the proceedings are with the occasional witty one-liner, there is very little of substance overall for these Tom cats to get their claws into. Any glimmer of hope (as with the dastardly Stickland’s Robocop’esque police force), is quickly lost in a story which would possibly make for a fun half hour TV show, but begins to ware thin when stretched over ninety minutes on the big screen. Whilst the main characters of TC and Officer Dibble are somewhat lacklustre, it is left to the sidekick cats (especially the wonderfully camp Choo Choo in his fetching white jersey), to spice up proceedings. On the evidence here a film featuring these five on their own would be much more fun. Top Cat: The Movie‘s accompanying press release claims that this summer sees the return of TC ‘after more than a 50-year hiatus’. After such a long catnap it’s a shame that his comeback is ‘fur from puuurfect’!